"Mum, can you pleaseee... bake this cake again?" pleaded my son whenever he ate the last slice of this banana chiffon cake. Again? Yes that I have baked this banana chiffon cake from Christine's recipe twice and yet my son can't have enough of it!!! Twice? For my first bake, I have baked the cake without the addition of cream of tartar and yielded an ultra soft and feather-light but rather short cake. Why am I omitting the cream of tartar? ... because I believe that the cream of tartar often acts as a stabilizer of meringue which can potentially cause the cake to more stable and rigid with less softer texture. 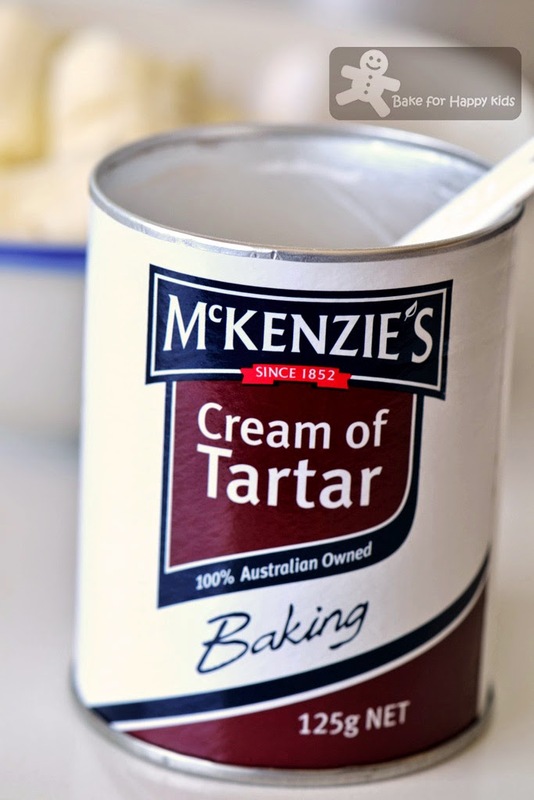 However, I have realised that the addition of cream of tartar can play quite an essential role in this recipe. Despite that I have followed the recipe entirely by using a 20cm tube pan, just lacking the cream of tartar simply can't beef up the volume of my first cake. To avoid having a short cake, I have baked the cake with the addition of cream of tartar and used a tall 17cm tube for my second cake. Although it works beautifully, the cake is less feathery light because of its stable structure. I have also noticed that the addition of 1/2 tsp cream of tartar is quite a high amount for chiffon cake in this size and has given the cake a hint of sourish aftertaste. In regardless whether the cake is short or not, sourish or not, my son is still a sucker for its feathery light texture and banana-y taste. Mum, can you pleaseee... bake this cake again? For my son, I might have to bake this cake again... Maybe with cream of tartar or not??? I can't really decide. 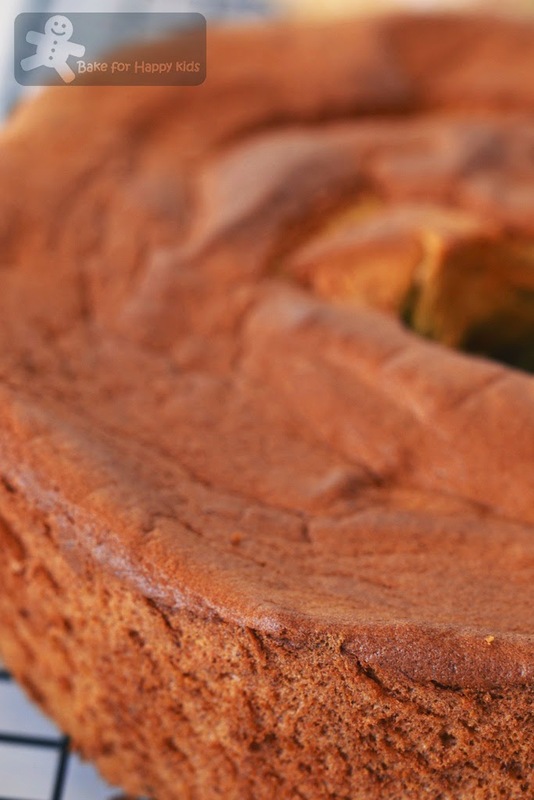 Update on 18 Oct 2016: Please go to this post for my BEST ultra soft banana chiffon cake recipe. 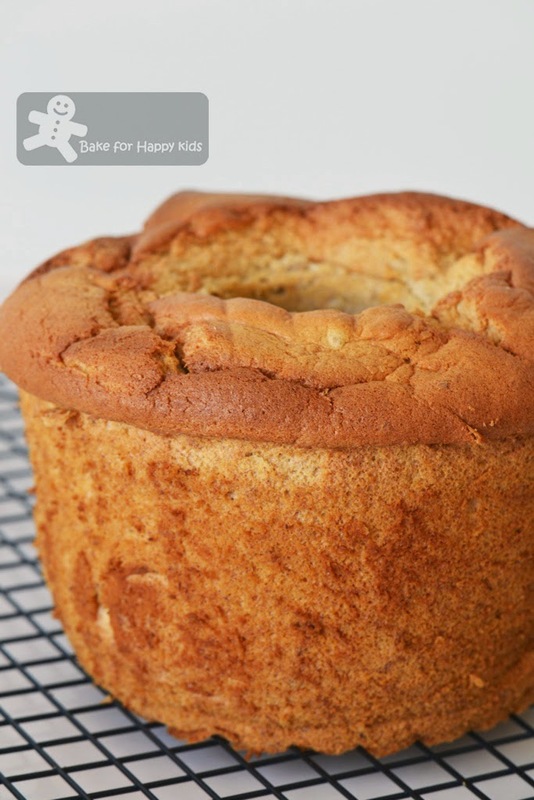 A short but super ultra soft chiffon cake! Typically, this is the yellow part of the chiffon cake batter. Sift in the dry ingredients and whisk gently until combined. Typically again.. This is the white part of the chiffon cake batter. Then, mix the yellow and white together and bake! ... but the cake is still so short like this!!! Obviously, this recipe needs the addition of cream of tartar! And, I have baked this second chiffon cake with cream of tartar. ... and yielded this tall and stable cake. Wow!!! This is the soft and feathery light chiffon texture that I'm talking about. ... but the cake without the cream of tartar is ultimately the softest! To add or not to add? I have been caught in this dilemma of adding cream of tartar in this recipe like a million of times!!! If I don't add the cream of tartar, the cake will be extremely soft but structurally, it will not be stable. To the extent that it is actually quite challenging to cut the cake without squashing it. If I choose to add the cream of tartar, I will get a nice looking stable chiffon cake but slightly less softer with a hint of sourish aftertaste. To add or not to add? What do you think? 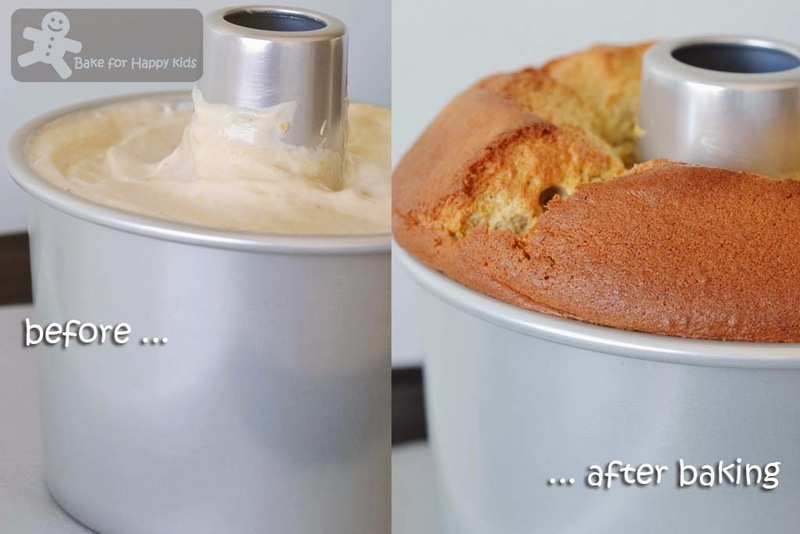 As the cake is very feathery light and fragile, it is highly recommended to use cake pan with removable base. *If you don't add the cream of tartar, your cake will be extremely soft but structurally, it will not be stable. If you add the cream of tartar, your cake will be stable and easier to handle but less softer with a hint of sourish aftertaste. Use a small or handheld food processor to process the bananas into smooth purée. Set aside. 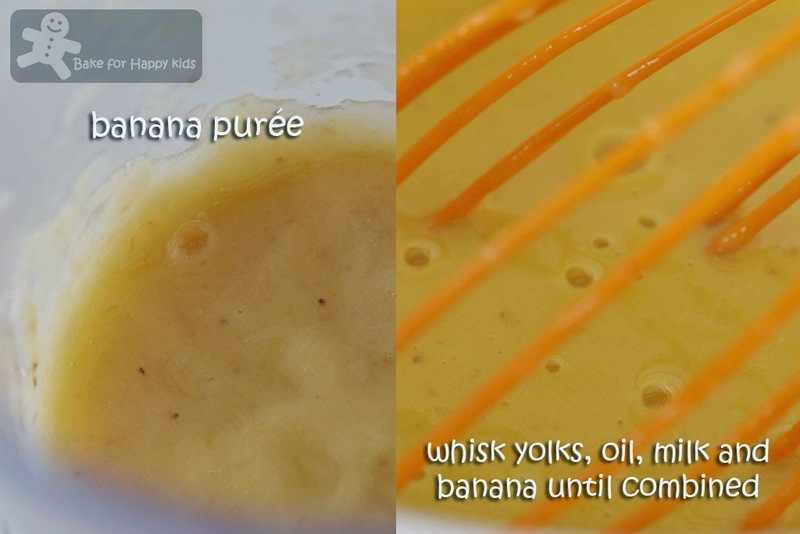 Using a hand whisk, combine egg yolks, oil, milk and mashed bananas in a large mixing bowl until well combined. 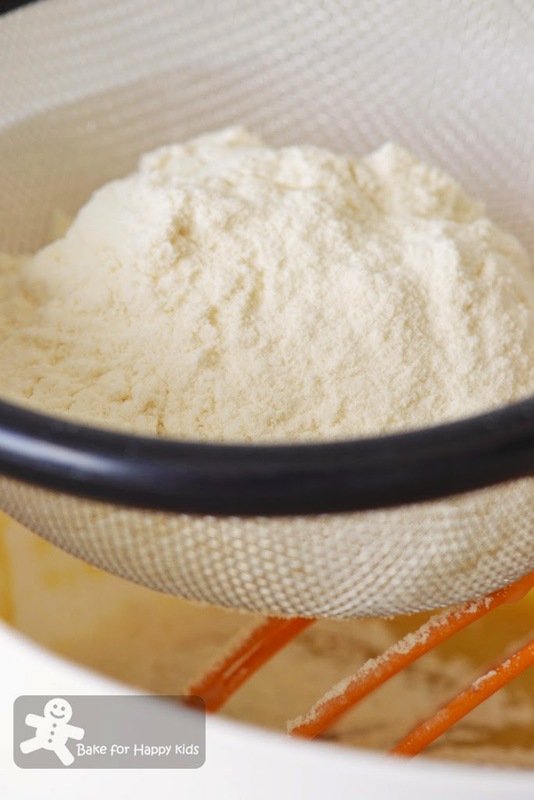 Sift in cake flour and salt and whisk gently until the batter is smooth and combined. 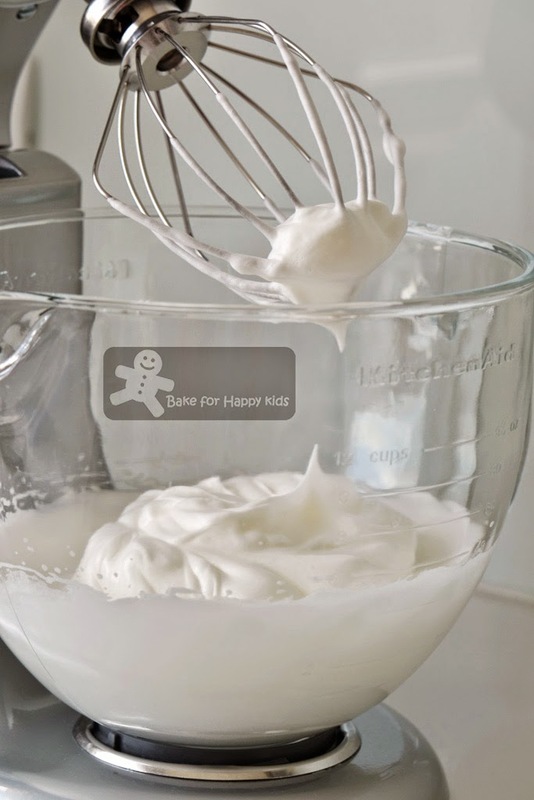 Use an electric mixer with a whisk attachment, beat egg whites at medium speed for about 2-3 mins until bubbles form. While beating, add cream of tartar*. 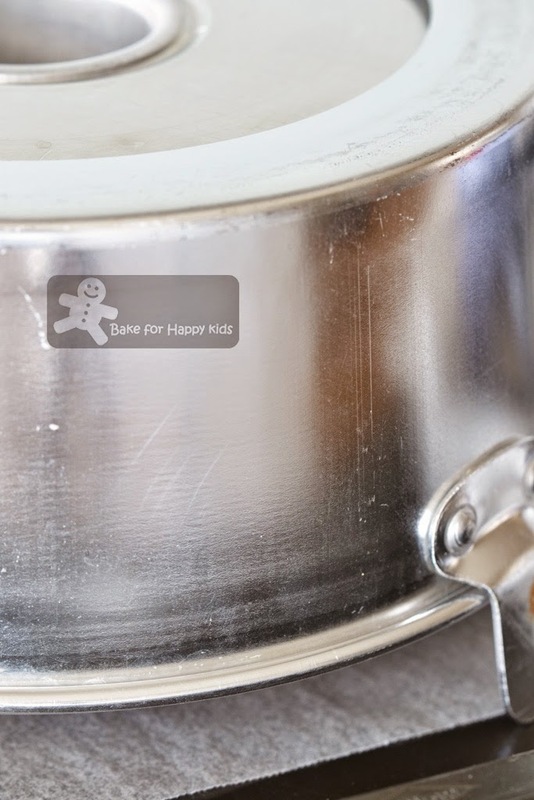 Increase the whisking speed to high and add the caster sugar gradually in 3-4 batches. Continue to beat until stiff peaks form. Fold in the egg whites mixture into the egg yolk mixture by batches. Add one third of egg whites at a time to incorporate the egg whites into egg yolk mixture. Mix the batter gently. Add the another one third of the egg whites into the egg yolk mixture. Keep mixing gently. Mix in the rest when the second third of the egg whites and the egg yolk mixture are well combined. Pour the batter into an un-greased cake pan and bake for 55 to 60 mins. Remove from oven and invert the cake immediately to cool on a wire rack. 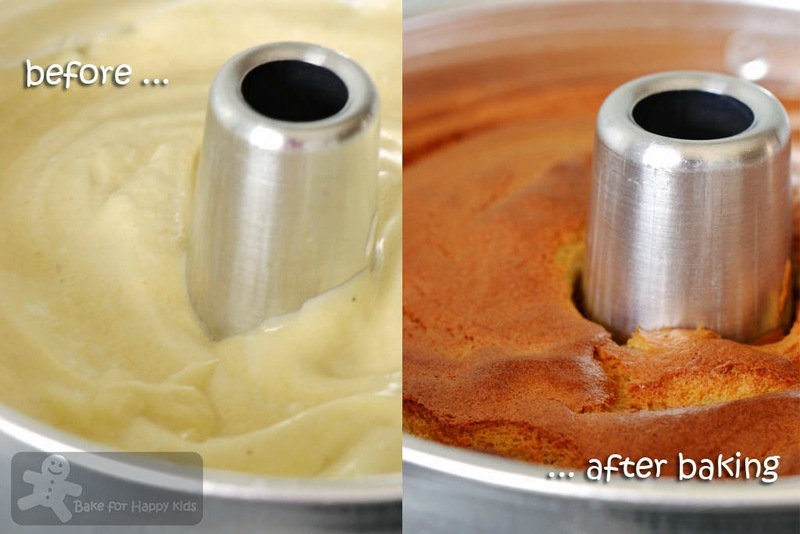 Allow it to cool completely before removing it from the cake pan. 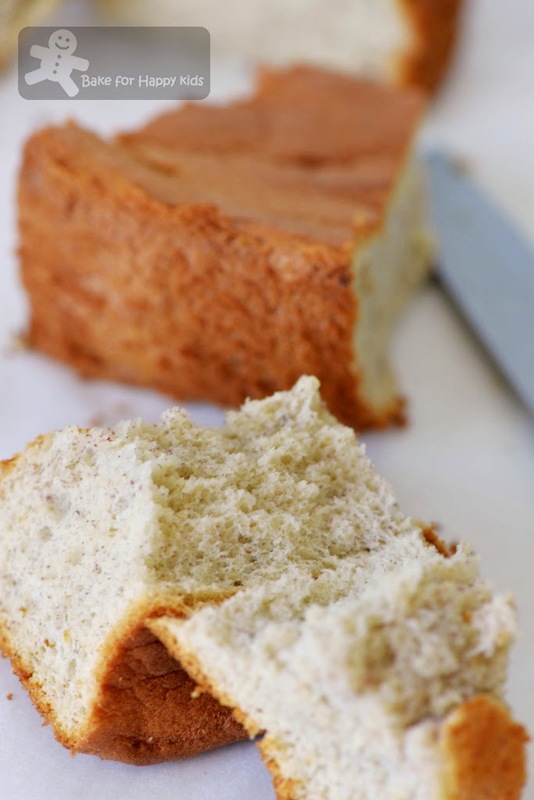 The cake can be very fragile and easily squashed and so it is better to slice with a serrated knife. 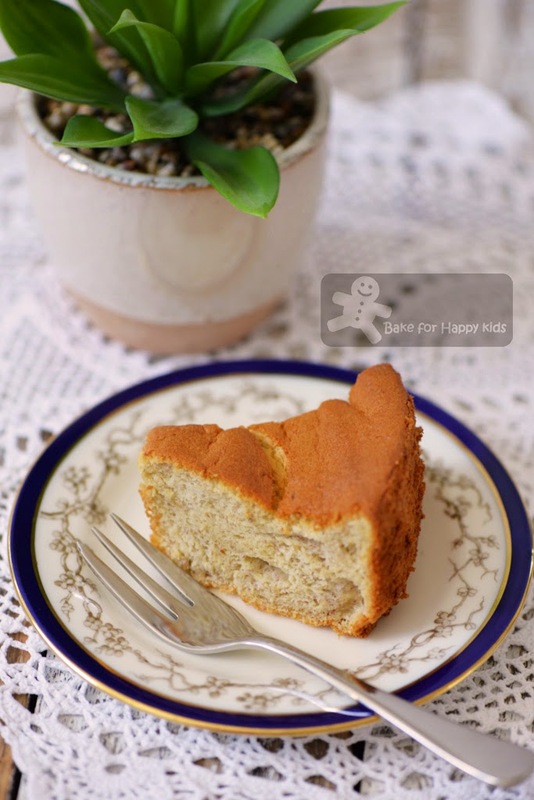 Serve and I'm sure that you will be in love with this super ultra light banana cake! Your cake looks really relaly soft and light, yummeehhh !! I've eaten pandan chiffon and orange chiffon, but never heard of banana chiffon.. You are so clever, using "heavy" stuffs (bananas) to make the cake into a light fluffy one (coz I always feel bananas will sink the cake down) !! Give me the whole cake, no problem for me one !! 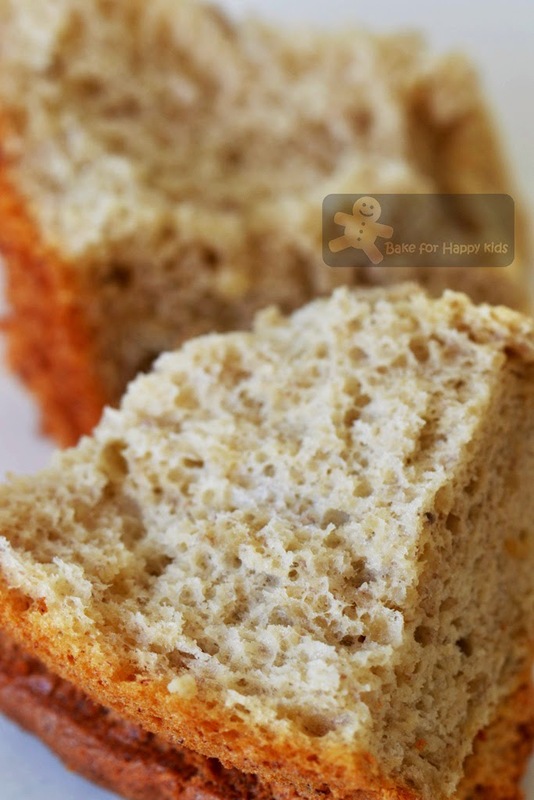 with cream of tartar or not, i love this with a cuppa anytime... one of the most classic bakes and yours look really yummy!! I prefer not adding it. I just don't like too much of chemical stuff in my cake. unless I bake it for an event, people always look for nice presentation rather than the test like we do right? haha. Zoe, can I have a piece of your yummy Banana Chiffon Cake to go with my piping hot coffee, pleaseeee? Yen, I must bake this banana chiffon cake! Your's looks so soft and spongy. No wonder your son can't get enough! I think you have mistaken me as Yen... LOL! 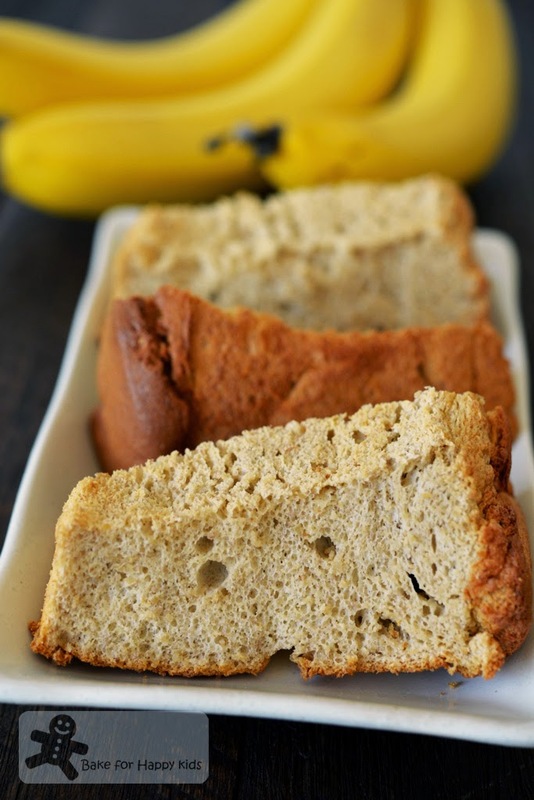 Zoe, banana cake is so delicious and yours looks so soft! Hi Zoe, both cakes are so super soft and feathery light chiffon texture to me ... Yummy-licious! Haha Phong Hong, I am so "touched" that I am in your "fingers"... hahahaha. Anyway Zoe, I can tell that your cake is very soft and fluffy. Looks really good! Thank you for the experiments! I probably won't put cream of tartar in just because of slightly funny after taste. The cake with cream of tartar is better looking though. Sounds so great! Oh wowie! Any banana lover's dream! I love all types of banana products! Cake, muffins, bread, pastry, pie! Everything and this looks fabulous! That's so sweet that your son was asking for it again and again, that's a sign of a favorite food! That cream of tar tar sure made a HUGE difference in that rise! Double thumbs up! Thanks for the recipe! Also tried using this recipe and a third of your pandan chiffon cake recipe to creat a banana pandan marble chiffon cake in a 20cm pan, and it turned out really good!